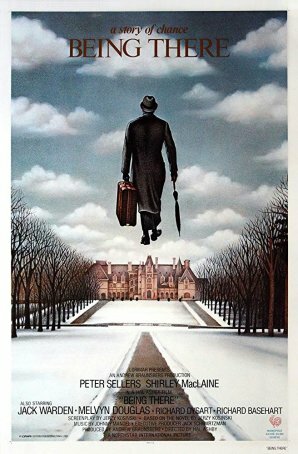 Being There, Hal Ashby’s 1979 adaptation of Jerzy Kosinski’s novel, is a delightfully dark comedy that, despite a cynical bent, offers viewers a good time. At the heart of Being There’s popularity is a recognition that even the most simple-minded person can put one over on the members of the so-called elite. In this story (as perhaps in life), the latter can be so self-absorbed and certain of their correctness that, rather than admitting to an error in judgment, they’d rather double-down on their original opinion and ignore the facts, no matter how obvious they may be. Wearing the dapper clothing given to him by his former employer, Chauncey is easily mistaken for a man of means and, when they meet, Ben takes him to be such. The two become friends, with the sick millionaire believing that Chauncey’s deliberate cadence and minimal talking are the result of his being a deep thinker. When he speaks concretely about gardens, Ben and Eve take his words as metaphorical. Ben is so impressed by his new friend that he introduces him to the President (Jack Warden), who incorporates some of Chauncey’s “gardening lessons” into a policy speech. Suddenly, everyone is interested in this mysterious new Washington insider. Aspects of the storyline and Sellers’ performance likely influenced a pair of 1990s movies, Blast from the Past and Forrest Gump. In the former, Brendan Fraser plays a naïve young man who has lived his entire life in a fallout shelter and, as a result, has a skewed perspective of reality. In the latter, Tom Hanks plays a simpleton who often finds himself involved in historical events and whose shallow pronouncements are often treated as sage nuggets of philosophical gold. Being There proved to be Ashby’s most commercially successful film. Although it garnered a couple of acting nominations (a Lead Actor one for Sellers, who didn’t win, and a Supporting Actor one for Melvyn Douglas, who did), none of the behind-the-scenes creative team was acknowledged. The Golden Globes and BAFTAs saw it differently, citing Ashby for his direction and Jerzy Kosinski for his screenplay. The film has stood the test of time remarkably well, seemingly as fresh and relevant today as when it was first released. In the Era of Trump, parts of it take on a meaning that the filmmakers couldn’t have imagined. It’s daring, satirical, and offers fodder for countless conversations about philosophy, politics, and the art of filmmaking. For Sellers, the performance cements a legacy that had already been strong. His work in Being There reminded audiences in the late 1970s and early 1980s that he was capable of more than the slapstick and pratfalls of Clouseau. For contemporary viewers, it puts an exclamation point on a career that, although uneven, occasionally achieved unrivaled pinnacles.